For fish all over the country, summer can be a stressful time of year. The hot, sunny weather we enjoy so much can lead to low flows in rivers, and stillwater fisheries (with ponds and lakes) start to warm up. A long warm spell can see our staff responding to lots of reports of ‘fish in distress’. Small stillwater are particularly susceptible as they don’t take long to warm up and for their water levels to drop. Every drop counts Preserve your water and monitor levels in your pools. Repair leaking sluices and control structures to preserve water. Are there other things you can do to keep the water level up? Sparkling or still? Keep an eye on the level of dissolved oxygen in the water. You should measure it at dawn, dusk and four hours after dusk and during the day if needed. Bubbles! Aeration equipment creates bubbles, putting more oxygen into water. It is invaluable and could be a life saver for your fish. You may be able to share equipment with other fisheries or make your own. Videos online can show you how to make a simple aerator using materials from your local DIY store. Spraying water into the air and back into the fishery through a hose can also help. Do you know about ammonia? Do you have a way to monitor ammonia and pH in the water? You can find simple kits for these online. When an algal bloom dies back it can release a lot of ammonia which can harm your fish. No sardines please. Fish stocking in the summer can put pressure on food and oxygen in the water. 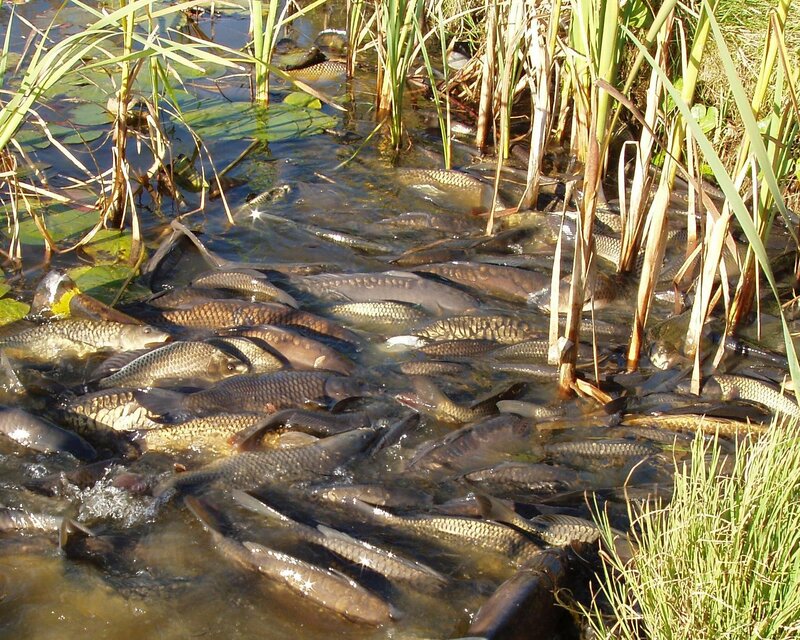 Higher stocking densities can also aid the spread of disease within your fishery. Think before you stock. Keep an eye out for fish disease. Do you know what to look out for when it comes to fish disease? Any unexplained fish deaths or suspected disease problems should be reported through our incident hotline on 0800 80 70 60. It’s vital to stop fishing on any affected waters to reduce the likelihood of spreading infections and reduce stress. Speak to your local fisheries team for advice. Clean up. Too many fallen leaves and decaying weeds in a stillwater can cause siltation and encourage algal blooms. Think about fish retreats. Deeper pools or areas of shade where fish can escape to cooler waters can also help them survive the hot weather. Be prepared. Think ahead and plan what to do in the event of an incident. Sharing these plans with staff or with angling club members will help them be aware and prepared to reduce the impacts of warmer weather and incidents at your fishery. The Environment Agency provides advice and guidance to fishery owners, and where it can, will help rescue or relieve fish in distress. If you see anything that should be reported, please call our 24 hour incident hotline on 0800 80 70 60 and we will advise on how to proceed.